In terms of today’s fashion, more emphasis is being placed on the modern man and his ability to accessorize properly. Fashionable jewelry has beenpushed to the forefront of style in recent years, but simply strapping on your expensive designer watch to go with your suit or blazer is no longer enough. These days, the fashionable male has an array of accessories he is able to effortlessly wear to work, play or any occasion. 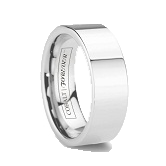 With all this in mind, the modern fashionable male has got to have mens tungsten rings in his accessories’ arsenal. 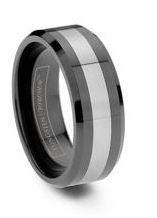 Well-known for their durability and resilience, tungsten rings for men are the perfect selection for a man’s wedding band, but wedding bands are just one aspect of these unique rings. With a large selection of styles, as well as an array of inlays and finishes, tungsten rings are the perfect complement to any wardrobe, watch or bracelet. 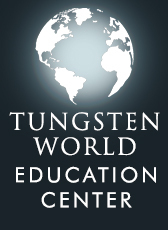 At Tungsten World, our staff is well-educated in all things tungsten. We can help you pick the perfect wedding band to last a lifetime, and then help you select something to simply go with your tungsten watch or cufflinks. 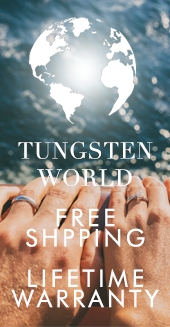 While any band on our site is made from the highest quality materials and the craftsmanship of our Tungsten Forever™ brand, making it the perfect forever lasting wedding band, we also carry many rings with accessorizing in mind. 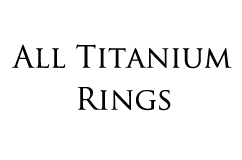 When looking for a tungsten ring that is more on the fashionable or accessory side, you are most likely looking for something a little less traditional, a ring reflecting more of your personality and personal style. Take for instance our two-tone ceramic tungsten rings. These rings couple black ceramic with tungsten in a variety of stylish patterns. The dark gunmetal finish of tungsten works well with almost any style, and black is always stylish. 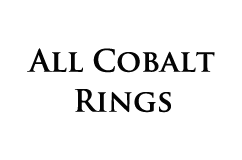 And of course, these rings are just as trustworthy as the rest of the rings on our site. They are made from the hardest materials available, and are almost scratchproof. Just because your ring is an accessory, doesn’t mean you should expect any less from its quality. 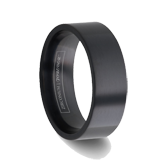 If a two-tone ring like the OCTAVIAN-8MM isn’t your style, we have many more designer quality tungsten bands you might consider. 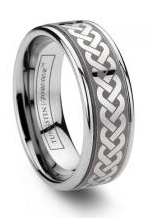 Take the GUINNESS, this stylish laser-engraved ring makes a great wedding band, but can also be a way of displaying your Irish heritage. For customers that like a faceted band masculine enough to wear to the office, and stylish enough to a night out, the NITRO might be more your style. You’re probably starting to get the idea now. 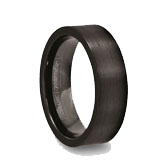 Tungsten carbide rings aren’t solely wedding bands anymore. With all the designer styles offered and tungsten’s inherent quality, these rings make the perfect accessory for any man. And even if it isn’t a ring you are looking for as an accessory, we’ve got you covered. 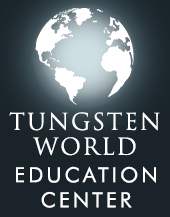 Check out of selection of tungsten watches, tungsten bracelets, and tungsten accessories like pendants and key chains.